A set of 3 kids white cotton standard handkerchiefs that can be personalised with a name sewn in fun and funky colourful embroidery thread. 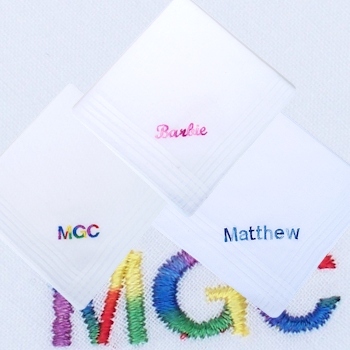 A set of 3 kids white cotton standard handkerchiefs that can be personalised with a name sewn in fun and funky colourful embroidery thread. Big and Little kids will love their very own set of hankies. A small size hanky to fit into their pocket. We can personalise the three handkerchiefs with initials or a short name. The hankies will be embroidered in your choice of colour, we have fun new variegated threads which means the colour changes from light to darker shades. We even have a rainbow effect thread that kids think is so cool! A unique and useful gift made for you by AmysGifts.co.uk! Please note: At Amys Gifts we do all our own embroidery work especially made to order and do our best to get all orders dispatched within approx 3 days.